I rue the day that someone coined the term “foodie.” It’s a word I loathe. And yet, I guess I am one. 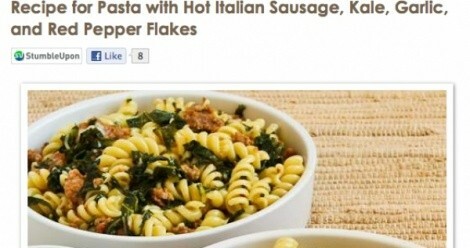 At any rate, foodies of all stripes are well served by the Internet. The information highway is jammed like Los Angeles’ 405 at rush hour with food-oriented sites. It seems like while 1 in 10 people now have their own TV cooking show, one in three writes a food blog. So, how do you sort through all of it? What’s delicious and what’s indigestible? I’m here to help. Having trolled the Web looking for interesting food and drink sites, here are some recommendations—some of my favorite places to hungrily lounge and linger. Let’s begin with cooking and recipe sites. FoodNetwork.com is ubiquitous and unavoidable. It’s where you’ll find recipes from the FN stars like Bobby Flay, Guy Fieri, Rachael Ray, Emeril Lagasse, etc. Unfortunately, that means that if you search for, let’s say, bison sliders, you’ll find recipes from Bobby, Guy, Rachael and Emeril—which isn’t necessarily a good thing. But, you’ll also find useful recipes from the real Food Network stars: Alton Brown, Tyler Florence, Giada de Laurentiis, Mario Batali and a few others. This is a well-designed, easy-to-maneuver site for recipes of all kinds and lots of useful videos. It just pays to be discriminating there. A site I visit frequently—especially when I’m looking for well-tested recipes for classics such as meatloaf, fried chicken, beef stew, etc.—is AmericasTestKitchen.com. This is primarily a subscription-based site, with lots of great how-to videos and recipes, along with valuable consumer product tests (best canned chicken broth, best butter and so on). However, you can get a lot of recipes and advice for free by subscribing to the ATK weekly online newsletter. The downside of this site is founder Christopher Kimball, who started in the print-magazine industry with Cooks Illustrated magazine and has all the visual presence and energy of Ichabod Crane. FineCooking.com is one more instructional site I like. It’s the online version of Fine Cooking magazine, with a very good search engine for finding recipes that incorporate specific ingredients. And I appreciate that Fine Cooking offers wine pairing suggestions with its recipes. Finally, as much as I hate to admit it, MarthaStewart.com is very well designed and features a vast array of flawless, creative, well-tested recipes. The section of Martha’s site called “Cooking 101” contains a gaggle of great tips, techniques and recipes for the less-experienced home cook. Cooking sites I try to avoid—in part because there are so many crappy, poorly conceived recipes on them, and in part because they are just so damned confusing—include AllRecipes.com, Cooking.com, Food.com and Epicurious.com. Does anyone actually ever test the recipes before they post them? I don’t think so. KalynsKitchen.com is a terrific blog by native Utahn and former teacher Kalyn Denny. This blog will be of special interest to folks interested in low-glycemic and South Beach Diet recipes. A fun, free-for-all blog to get lost in is Burekaboy (at Blogger.com), a self-described “food-obsessed Canadian who loves to research, read, write and talk about all things culinary.” His collection of recipes, cookbook clippings and assorted other culinary paraphernalia is immense fun to delve into. So, now that we’ve located some worthy recipe and cooking sites, where do we go for ingredients and kitchen supplies? There are a few retail food sites I couldn’t function without. I love SpanishTable.com, the online shopping center for the Santa Fe, Seattle, Mill Valley and Berkeley Spanish Table stores, which specialize in imported products from Spain and Portugal. From paella pans and cataplanas to Spanish smoked paprika, this is a terrific place to stock your kitchen pantry. For decades—first from catalogs and now online—I’ve turned to Wisconsin-based Penzeys Spices (Penzeys.com) for, well, spices. If there’s a spice Penzeys doesn’t sell, it probably doesn’t exist. One state over, in Ann Arbor, Mich., is Zingerman’s. The online shop (Zingermans.com) features estate-bottled olive oils, handmade cheeses, hearth-baked breads, gourmet vinegars and much more, all ready to be delivered to your doorstep, overnight. For paté, foie gras, duck confit, poussins, capons and the like, I turn to Dartagnan.com, which ships all products overnight, via FedEx. And when the occasion calls for caviar, I recommend Seattle Caviar Company (Caviar.com), which sells sustainable caviar, including Israeli Galilee Osetra and American White Sturgeon. For fresh truffles online, there’s really only one smart choice: New York City-based Urbani (UrbaniTrufflesOnline.com), which offers an array of top-quality imported truffles, in season. Currently, my favorite food site of all is AvecEric.com, which follows the culinary adventures of Eric Ripert, celebrated co-owner/chef of Le Bernardin restaurant in New York City, one of the world’s best restaurants. The restaurant is closed for renovations this month—the first time Ripert has ever taken a month off. And during that time, he’s sharing pieces of Le Bernardin’s history with readers, including links to fascinating articles like the original New York Times review of the restaurant, timeless recipes and much more. Well, those are mine. What are some of your favorite food sites—local, national or international?